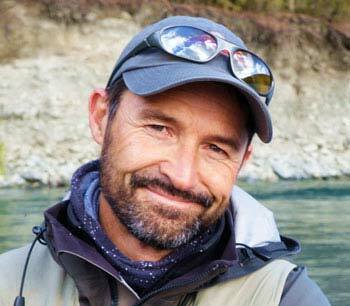 Head guide Mike Kirkpatrick – proud member of the NZPFGA (NZ’s professional Guides Association). Mike considers himself blessed to be able to guide in one of the most stunning fly fishing playgrounds in the world. About me; I was born in Christchurch (1964) and moved from there to Nelson about 28 years ago to continue my love affair with the ‘top of the South’ on a permanent basis. As an 18 year old, I used to hop on my first motorbike and head in to the Lewis Pass region (2.5 hours drive) most Friday evenings in summer, camping for the weekend to hunt and fish – sometimes with mates but often by myself. These trips ingrained in me a deep love for the South Islands ruggedly beautiful back country, which time has only served to enhance. The move north to Nelson in 1990 to set up a small Signwriting business, gave me the opportunity to pick my days off to fish the regions wonderful waterways. It was in this period of my life where i gained some clarity on what i wanted to do with my working life – take people fishing! I quickly developed an even more intimate knowledge of the Nelson, Murchison and West Coast waterways and finally made the transition to Guiding in 1999. I’ve been fortunate enough to appear in various local and overseas magazine articles, and am currently a writer and photographer for New Zealand’s premiere fly fishing magazine ‘FISH AND GAME’. I guided and helped with filming for Denmark’s Niels Vestergaard and Morten Oeland while they were filming for the DVD series ‘THE FISH AND THE FLY’. More recently i have appeared in Gin Clear Medias ‘NORTH ISLAND and SOUTH ISLAND BACKCOUNTRY’ DVD series and also the TV series ‘PURE FLY’, featuring some of the finest sight fishing on the planet. I’m also the producer of the very well received ‘NEW ZEALAND FLY FISHING ADVENTURES’ DVD series, featuring fly fishing waters around the the top of the South region. (available direct from my DVDs page) I also have a YOU TUBE channel ‘mikefsher’ that is very active and has 2 million views, showcasing the best of what i do. I have a passion for people and guiding them through amazing adventures that burns as bright now as ever. I listen to what YOU as an angler want, and give gladly any ‘coaching’ you may want or need in the pursuit of success without losing sight of the fact that this is fun!! I love a laugh and my attitude is always a positive one in the wonderful pursuit of Trout. Although the local day trips are the ‘bread and butter’ of my season, I tend to specialize in the ‘postcard’ type fly fishing. In other words, the sort of trips that will haunt your dreams. The hike in, boat, 4×4 and helicopter type trips with a mind to getting into the sort of country that will make your heart ache when later reminiscing. The places that actually take your breath away. The campfires at night, the fireside chats, the waking to birdsong and the sound of the river with it’s softly spoken invitation to explore it’s hidden treasures. Nelson has a wonderful Mediterranean style climate with an abundance of rivers, lakes and steams giving you literally hundreds of miles of fly fishing water within a few hours drive, and the scenery is often nothing short of breathtaking. The diversity of these waterways is also amazing with no two rivers the same – from the slightly tannin stained West Coast, to the gin clear headwaters of Kahaurangi National Park. We have everything an outdoors person could want within a short distance in almost any direction, from hunting to salt water fishing and more importantly our freshwater fly fishing in amazing gin clear trout waters to die for! (6lb+ brown trout average in some places). Add to this a growing salt water fly flats fishery for meter long Kingfish in the Golden Bay region, and you’ve run out of excuses not to come! As I have been hunting and trout fishing this region for over 35 years, there are not many areas I don’t know about. I love nothing more than taking a client into a wilderness area to hunt large predominantly Brown trout. If you really want to get into Nelson, Marlborough, West Coast or North Canterbury back country fishing – whether by 4wd, Helicopter, boat or Hike, I will prepare a trip to suit. ‘I pride myself on a friendly and professional service that caters for all skill levels and techniques. Whether you’re an expert fly fisherman or a first time angler looking to land his first trout, I can tailor an excursion to suit. I keep myself very fit and you can trust in the fact that I can and will work tirelessly to provide you with the experience of a lifetime’. Hello Mike, I’d like to take this opportunity to say thank you for giving me the fishing experience of a lifetime! To me, those days were far beyond anything previously experienced, about much more than the fishing itself, and actually quite overwhelming. A defining moment in life, you might say, so let me put a few words on how I perceived those days. The fishing? Well, that Tuesday exceeded “super fishing” – I had never thought fishing could be this good! You used the term “Rolls Royce fishing”, which covers it perfectly. Vintage, top drawer, excellent and so on could be used as well. What made it so good was not just the numbers or the quality of the fish, but the whole experience: the wilderness; solitude… …In particular the two consecutive six-pounders towing around roots and tussocks in those super-pools, with luck on our side; the ones that got away and made sure I’ll be back next year; the technical walk up the river, a good day’s work-out and very enjoyable; the hut, the food and the helicopter and I could go on. Just as importantly, we could talk about things other than the fishing, which is needed when alone for three days. Bottom-line, Mike, this was a life-time fishing experience with an impact beyond and about life. You made it happen and I am very grateful for that. The fact that you press tirelessly to cover a few more stretches of water, where others would have returned to the comfort of the hut (well, comfort…!) just shows your dedication to making this a perfect experience. This is a highly satisfied and returning customer! Mike knows where the best fish are - he's a standout within the industry, you are in very good hands! I am back in the Danish winter! I have to tell you that it was great experience to fish with you Mike. I have great respect for the way you work. You are a great fly fisherman. It was a pleasure all 9 days we spent by the rivers. I hope we can go fishing one day in New Zealand without the camera – just fishing :*) I will email you some photos from the perfect days of fishing in NZ. One of the highlights of my trip to New Zealand was hooking up with Mike. My only regret is that we had to leave before fishing about a dozen more rivers. Beautiful rivers, big trout, and a Guide who is a fisherman at the top of his game and a joy to fish with. Hi Mike We are back in UK having had a super holiday once again. One of my high lights was my days fishing to exhaustion with you. 🙂 I was very impressed with how you got me on to that brownie by trying a number of flies at different depths to tempt it, and then for me to pull the fly out after it took most of my line out in crossing and running downstream!! I still have your brochure and details and will pass them on to any of my contacts who are coming your way with my strongest recommendations. I wish you good luck with your video enterprises and would like details of them in order to buy one. Could you also please send me a copy of the picture you took of me. I thought Mike was a superb guide, not only did I catch my first NZ brown Trout with Mike but I also caught a second fish at near trophy size, at 9.5 lbs. Thanks again for your help and I will be back for another trip sometime soon. Dear Mike, My wife and i are back in boring Singapore where there are too many people and zero trout! Just want to thank you again for looking after us so well for the 3 day/2 night wilderness river excursion you took us on. Despite having fished in your beautiful country for the past 15 years, it was a new and interesting experience and exciting fishing too ! As we have shared with you, we are always on the lookout for competent and friendly guides whom we feel that we want to return to and we have found that in you ! My wife is still talking about how fit you are and how you move from rock to rock in the river like a mountain goat while spotting fish. We truly appreciate your hardworking attitude in your guiding and wanting to do your best for your clients ! We also find that you are an excellent instructor and have learnt a lot from you. We look forward to fishing with you again in the near future ! Hi Mike, Thanks for all your excellent guiding during our stay. Didn’t do too well ourselves – got blown off the Wairau (you did warn us about that! ), fished the upper Buller for a couple of trout (not big), tried again on the xxxx river at a couple of locations and only managed to scare some big trout – but at least we did manage to sight them, so learnt something from your expertise. Fished the Motueka for one small trout, but as everyone told us Mot. was a bit warmer than it should be. The big lesson that I learnt from this trip is that to do well in NZ you need a guide. Fuad has sent photos on to me – thanks for that, much appreciated. The highlight for me was definitely our trip to the xxxx – a magnificent river and area to be in – even if I did stuff up a few casts! If you get the chance would appreciate the details of your poly leader – it obviously works well in presenting the fly but needs a little practice to handle correctly. Thanks again for your guiding and good humour along the way – a very enjoyable experience. Plan to be back, and will definitely be in touch with you should that eventuate. Merry Christmas and all the best for 2011. ‘Fishing with Mike Kirkpatrick (Latitude Guiding) was the highlight of my trip to New Zealand. Mike helped me with a number of “tricks” that helped me throw the fly where I wanted it and drift like it should to land some nice rainbow trout’ (over four pounds). ‘The trout were wild and jumped like they really wanted to get away, which some of them did’. Thanks Mike. Gerry McCain Ashland, Oregon U.S.A.